When you think of Carnival and Italy, floats, masquerade balls and orange-throwing are most likely to come to your mind. However, Carnival celebrations in Italy would not be complete without the sweet pastry fritters that are prepared and eaten in the heady days leading up to Lent. Cenci, chiacchiere and crostoli, are just a few of the many names you may hear for these scrumptious fritters along the Italian peninsula. The recipe, however, is virtually the same everywhere. Essentially, a sweet dough is flattened into thin strips that are then deep-fried and served coated in sugar. Here in Piedmont, they are called bugie. Like Carnival, bugie appear to have their origins in the ancient Roman festival of Saturnalia. During festivities in honour of the deity Saturn, fritters similar to bugie called fricitilia were prepared in large quantities, fried in pig fat and distributed to the masses. These days, most people prefer to fry their bugie in vegetable oil. However, with all that butter, egg and liqueur in the dough, bugie are rich regardless of the cooking fat used. If though, you really wish to indulge your sweet tooth, why not try the even richer versions of these fritters to be found in the supermercati and pasticcerie at this time of year. Bugie ripiene (bugie stuffed with cream, Nutella or jam) or bugie drizzled in chocolate are just some of the mouth-watering variations on the original recipe. Personally though, nothing beats the simplicity of the traditional bugia. Here is my recipe for making them. Please note that the rhum can be replaced with another liqueur or spirit (such as Marsala or Grappa) and the lemon rind with another aroma (such as vanilla) if you wish. I would also recommend drinking a glass of Moscato d’Asti DOCG while eating them. The perfect combination! Sift flour, sugar, baking powder and salt together in a large bowl. In a small bowl beat eggs, melted butter and rhum together. Add wet ingredients and lemon zest to large bowl and mix together. Knead mixture on flour-dusted work surface until dough is smooth and elastic. If mixture feels a little bit dry add a bit of water at room temperature. Wrap dough in cling film and allow to rest for at 30 minutes in refrigerator or another cool place. Take one ball (ensure the others remain covered while they are not being used) and pass it through pasta machine several times until dough is smooth. With each run in the machine, reduce the thickness setting until reaching 2mm. Repeat the same procedure with the other balls. With serrated pastry wheel, cut strips into desired shape(s). Heat vegetable oil in deep frying pan. Fry bugie for about a minute on each side or until a nice gold colour. Try not to overcrowd your frying pan with too many bugie at once to maintain the high temperature necessary for deep-frying. So, wherever you are this carnival, find time to try and make these sweet pastry fritters. You’ll have great fun and something delicious and tasty to share and eat at the end. 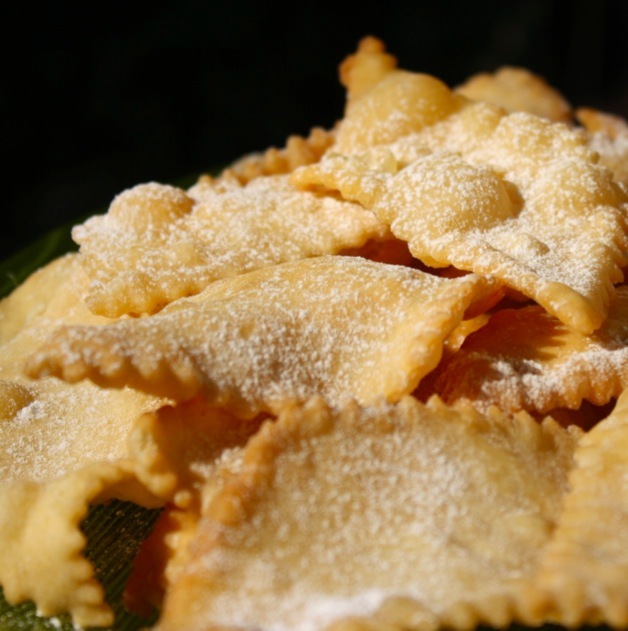 Plus, at Turin Italy Guide, we’d love to hear your carnival fritter making stories. Let us know how they turn out! Photo compliments of Travel Langhe.